If the word of the day is “concise,” and for me that might not be a bad thing, the Utah Jazz is the perfect franchise to try to sum up. Simply put, the history of the Jazz organization- the last three decades in particular- is best summed up in two words: stability and consistency. In the 31 years since moving from New Orleans to Salt Lake City, the Jazz have the taken floor under just three coaches- Tom Nissalke for 2+ seasons, the outgoing Frank Layden for the next 6+ seasons, and the maniacally intense Jerry Sloan for the past 22 and change. Over the past 27 years, or the combined Frank Layden- Jerry Sloan era, the Jazz have finished .500 or better 26 times, have made 23 trips to the postseason (21 of them consecutively), have won 50+ games 14 times, 60 or better three times, made six appearances in the Western Conference Finals and a pair of trips to the NBA Finals. Over than same period, the Utah Jazz franchise has enjoyed incredible stability in the owner’s suite as well, with local business mogul, the late Larry Miller (and his family following his passing in 2009) owning the team for the entirety of that period. The franchises stability extends beyond coaching and ownership. The Jazz roster through the years is also notable for its lack of a revolving-door. Through the years, 26 players have played 300+ games with the Jazz, 13 of them averaging 10+ ppg for the franchise. Finally, in terms of star power, the Jazz has had plenty. While the franchise has only featured six legitimate stars (Pete Maravich, Adrian Dantley, Karl Malone, John Stockton, Deron Williams and Carlos Boozer) in 36 years, each suited up in at 330 games for the Jazz and spent the best years of the respective careers with the franchise. From New Orleans to Salt Lake City. From Layden to Sloan From Pistol to Dantley to Stockton-Malone to D-Will and Boozer. The journey of the Jazz has been nothing, if not stable and consistent. Tough break for Deron Williams! Arguably the best PG in the NBA, unselfish, a sublime passer and an all-around offensive threat. He’s got virtually no shot at ever holding this spot. For the foreseeable future- and probably beyond- this spot will belong to John Stockton. This feat is made all the more impressive by the fact that Jon Stockton looks more like an accountant than an NBA all-timer. It’s tough to remember a single instance in which John Stockton made a mental mistake, forgot his limitations, or those of a teammate. John Stockton is one of the most composed players ever to take the floor and perhaps the most statistically accomplished PG in NBA history. More impressive than Stockton’s incredible numbers (more on this in a second) are his off-the-charts basketball IQ and mastery of the team game. John Stockton never made a selfish play, never failed to hit the open man, knew where every teammate liked the ball, was a maestro on the break and mastered the pick-and-roll better than perhaps any PG in NBA history. It’s pointless to examine Stockton’s place in Jazz history (he and Karl Malone are 1-2 in virtually every meaningful category), but more useful to examine his place in NBA history. No player in NBA history has played more games with a single organization that Stockton’s 1,504 with the Jazz, and in NBA history, only Robert Parish and Kareem Abdul-Jabbar have played more games. Stockton missed just 22 games in 19 seasons, and excluding the 1997-98 season, he missed a grand total of four games in eighteen seasons. Unreal! Stockton played 47,765 minutes in his career, fifth all-time and more than any backcourt player in history. His 15,806 assists are not only the most in NBA history, but more than 50% better than Mark Jackson’s second place total of 10,204. Starting in 1987-88, Stockton averaged at least 10.5 apg for ten straight seasons, 12+ in eight straight and dished out a staggering 13.6+ dimes per game during the first five years of the streak. It’s a similar story with his all-time steals mark of 3,265, which is 751 better than Michael Jordan’s 2,514. Again, for ten straight seasons starting in 1987-88, Stockton registered at least 246 steals, nabbing at least 262 in each of the first eight years of the streak. For good measure, he scored 19,711 points, just 13.1 ppg, but good for second in franchise history. For his efforts, Stockton was rewarded with ten All-Star selections (1989–1997, 2000), two All-NBA First Team selections, six All-NBA Second Team Selections and five All-Defensive Second Team selections. Also, in Stockton’s 19 seasons in Utah, the Jazz reached the postseason 19 times, advanced past the first round ten times, reached the conference finals five times and the NBA Finals twice. In 182 career postseason games, Stockton averaged 13.4 ppg and 10.1 apg, averaging 10+ apg in 11 of 19 playoff appearances. 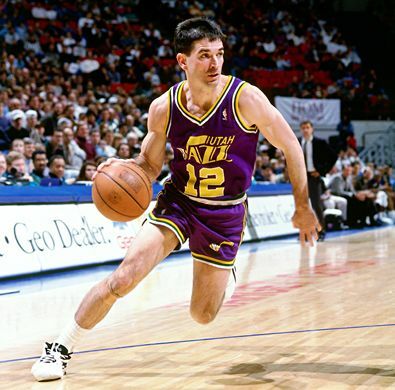 Along with Malone, his running mate of nearly two decades, and coach Jerry Sloan, John Stockton is the Utah Jazz. If Magic Johnson is the best “pass first” PG ever, John Stockton is the best “past first, second and third” PG ever. “Pistol” spent his first four NBA seasons- two of them All-Star-worthy- in Atlanta, but reached his peak (post college) as an individual player with the New Orleans Jazz. After an outstanding run with the Hawks, “Pistol” spent his next six seasons- the first six in franchise history- with the Jazz. 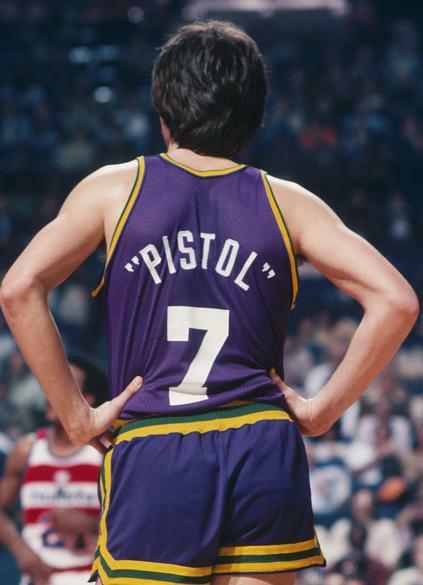 While his scoring slipped (21.5 ppg) in his first season with the Jazz, Maravich quickly returned to form, averaging 25.9 ppg and a career-high 31.1 ppg, respectively, in the next two seasons, earning a pair of All-NBA selections and his third career All-Star selection (25.9- 4.8- 5.4 and NO All-Star nod? Huh?!) These would be the last relatively healthy seasons of his career, as Pistol Pete would fail to play more than 50 games in any of his last five seasons. However, despite being battling injuries for the remainder of his career, Maravich maintained his spot in the NBA’s top tier, averaging 24.8 ppg and 5.9 apg over the next two seasons, and earning the fourth and fifth All-Star selections of his career. While the spectacular has become somewhat commonplace in today’s NBA, very few, if any, players in the 1970s were capable of reaching the spectacular heights at which Pistol Pete idled. However, as was the case with his first four NBA seasons in Atlanta, Maravich didn’t enjoy much team success with the Jazz. In six seasons (five in New Orleans, one in Utah), Pistol Pete did not play on a better-than-.500 team and failed to reach the postseason. Finishing a solid second place here is Jeff Hornacek, John Stockton’s backcourt mate for much of the 1990s. After being acquired via a trade in early 1994, Hornacek spent 6+ seasons (felt like more, didn’t it?) with the Jazz, where he averaged 14.4 ppg, 4 apg and made 49%- 90%- 43% from the field, the free throw line and beyond the arc, respectively. He was a consistent (averaged between 12.2 and 16.5 ppg in his six full seasons) and incredibly efficient perimeter scorer. While with the Jazz, Hornacek never shot worse than 47.7% from the field or 88.2% from the free throw line and only once in six full seasons made less than 40.6% of his 3-point attempts (36.9% in 1996-97). “Horny” was always in tune with Stockton, a master at moving without the ball and seemingly always in rhythm. Unless you’re a Jazz fan, it was a terrifying sight to see Hornacek come off a Karl Malone pick, grab a Stockton pass right in his chest and elevate for a jumper. During his time with the Jazz- which included seven consecutive playoff appearances, four trips to the conference finals and two to the NBA Finals- Hornacek was the team’s second scoring option behind Karl Malone and Stockton. A phenomenal shooter and an outstanding teammate, Jeff Hornacek played an integral role on one of the best teams of his era. Also worthy of a mention here is the man traded in order to acquire Jeff Hornacek, Jeff Malone. Like Hornacek, Malone was extremely gifted at running defenders through screens and teamed up well with John Stockton. After earning a pair of All-Star selections in seven seasons with the Washington Bullets, “the other Malone” joined the Jazz prior to the 1990-91 season. While he may not have been the greatest all-around two-guard, Jeff Malone was exceptionally efficient and possessed a fantastic mid-range game. In each of his three full seasons with the Jazz, Malone averaged 18.1 ppg or better and made at least 49.4% of his field goals. 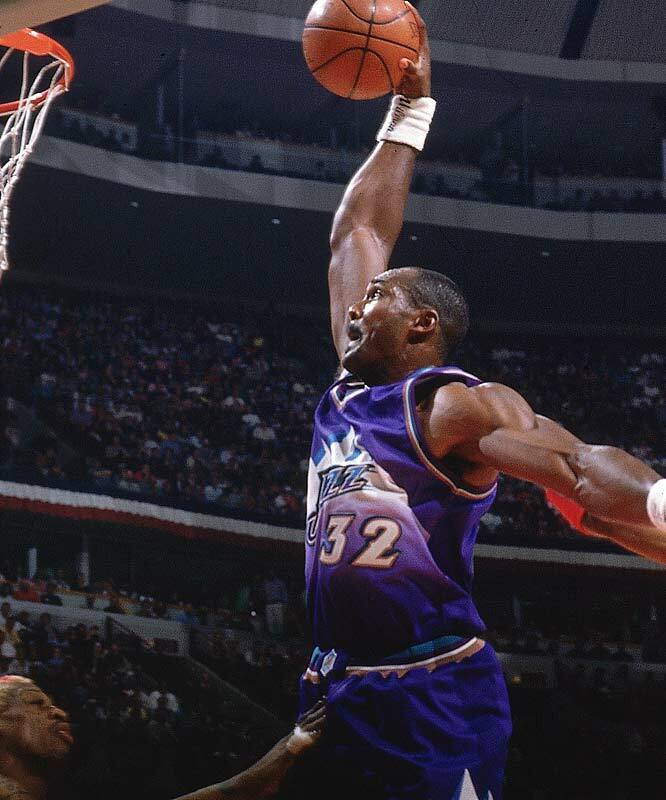 The Jazz reached the postseason in each of Malone’s three full seasons, making their first ever trip to the conference finals in his second year with the team, 1991-92. In each of his first two playoff runs with the Jazz (25 games total), Jeff Malone averaged 20.7 ppg on 49% and 89% from the field and the line. 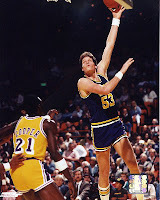 In 277 games with the Jazz, Jeff Malone averaged 18.5 ppg (second among backcourt players) and shot 50% and 88.1% from the floor and the free throw line, respectively. Sadly, that gaudy free throw percentage is only good for third in franchise history (minimum 100 games played), behind Hornacek and Kyle Korver, each of whom hit 89.7% from the line. When discussing the greatest players in Jazz history, Karl Malone, John Stockton and Pistol Pete receive the lion’s share of attention, but Adrian Dantley was awesome in his time with the franchise. Dantley’s one of the best scorers in NBA history, and he earned a significant chunk of that distinction with the Utah Jazz. Dantley was the sixth pick in the 1976 draft. After starting out with the Buffalo Braves and winning the 1976-77 Rookie of the Year award, he was traded to the Indiana Pacers prior to his second season, and again to the Lakers after just 23 games. He finished the 1977-78 season and spent the following season in L.A. before being traded again, this time to the Utah Jazz. Once he arrived in Utah, Dantley hit his stride as an elite NBA scorer. In seven seasons with the Jazz, Dantley was an All-Star six times (a wrist injury limited him to just 22 games in 1982-83), averaged better than 30 ppg four times, never averaged fewer than 26.6 ppg, shot between 53% and 58% from the field, won a pair of scoring titles (30.7 ppg in 1980-81 and 30.6 ppg 1983-84) and was selected All-NBA Second Team twice. 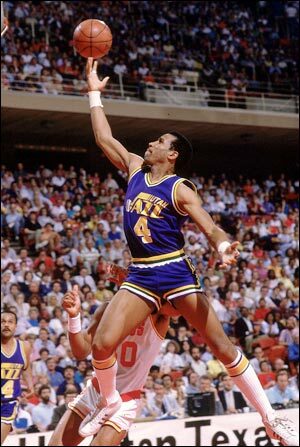 After playing for some mediocre teams in his early days with the franchise, Dantley led the Jazz to second round of the playoffs each of his last two seasons, averaging nearly 29 ppg and 7.5 rpg in 23 postseason games. Also deserving a mention here is Thurl Bailey, the seventh pick in the 1983 draft. Bailey spent 8+ seasons with the Jazz and combined with a young Karl Malone to form one of the NBA’s best frontcourt tandems. Bailey played 708 games in Utah, and averaged 14 ppg and 5.5 rpg. He scored in double figures in seven of his eight full seasons with the Jazz, and enjoyed a strong two-year peak in 1987-88 and 1988-89. Over that two seasons span, he didn’t miss a game and averaged 19.5 ppg and 6 rpg. Thurl Bailey was also a solid postseason performer averaging 10+ ppg in each of his first seven postseason appearances and 15+ ppg five times. He enjoyed his postseason performance in 1987-88, when he averaged 23.2 ppg and 5.7 rpg in 11 playoff games. With all due respect to Truck Robinson (23.2 ppg, 14.9 rpg in 125 games in the late 1970s), Carlos Boozer and future Paul Millsap, there’s not even a conversation to be had here. Karl Malone is one of the hardest workers and greatest specimens ever to play in the NBA. However, while he had the strength of an NFL defensive lineman, Malone was also as skilled a power forward as the league has ever seen. Teaming with John Stockton, he fill the lane masterfully on the break, perfected the pick-and-roll, had a silky shooting touch to about 17 feet and could bang in the paint with anyone that’s ever played. Malone was the model of consistency. He missed nine games in his first 18 NBA seasons. Read that again. Malone averaged 20+ ppg in 17 of 18 seasons with the Jazz and was good for 25+ a dozen times, with eleven of those seasons coming consecutively. Additionally, Malone holds the NBA record with 2,000+ points in 11 consecutive seasons (1987-88- 1997-98). Including that streak, he achieved the feat in 12 of 13 seasons, with the truncated, 50-game 1999 season serving to break the run. In terms of honors and accolades, Karl Malone doesn’t quite fall short either. He was named an All-Star in each of the 14 seasons from 1987-88 through 2000-01, won a pair of All-Star MVPs (1989 and co-MVP in 1993, fittingly with John Stockton), earned 11 consecutive All-NBA First Team selections, was named All-NBA Second Team twice and named league MVP in 1996-97 and again in 1998-99. The only part of Karl Malone’s body of work that is less than bulletproof is his postseason success, though talk of his “inability to perform in the playoffs” is becoming a bit overblown. In his 18 seasons in Utah, the Jazz reached the postseason 18 times, advanced past the first round nine times, reached the conference finals five times and the NBA Finals twice, falling to a pair of Jordan-led Bulls teams that simply were not going to lose. Individually, Malone was every bit the stud in the playoffs that he was in the regular season. In 172 postseason games with the Jazz, Malone averaged 26.3 ppg and 10.7 rpg. In 18 playoff appearances with the Jazz, Malone averaged 20+ ppg 17 times, scored 24+ per game 13 times, and averaged no worse than 26- 10 in the team’s five conference finals runs. Believe what you will, sounds like nonsense to me. In short, Karl Malone’s name belongs near the top of any short list of the greatest players in NBA history. This spot came down to a pair of unspectacular, long-tenured big bodies- Mark Eaton and Greg Ostertag. Across the board, Eaton was the pick here. Ostertag spent ten of his eleven NBA seasons with the Jazz, played for three conference finalists and was in the middle for both of Utah’s Finals runs in the 1990s. While his stalwart role on the most successful postseason runs in franchise history are enough to warrant an honorable mention, Ostertag’s lack of a specialty on the floor, his totally underwhelming stat line (4.9 ppg, 5.7 rpg, 1.8 bpg in 700 games) and lack of a statistical prime (career highs: 7.3 ppg in 1996-97 and 7.4 rpg in 2003-04) make it impossible to give him the nod here. While sporting a stat line that’s only slightly better than Ostertag’s, Eaton was the franchise’s defensive anchor in the 1980s and remains one of the best shotblockers in NBA history. While Stockton, the Malones (Karl and Jeff) and Thurl Bailey powered the Jazz in the 1980s, Eaton’s defense was also a major factor in the franchise’s rise to prominence. When Eaton arrived as a rookie in 1982-83, the Jazz had yet to reach the NBA Playoffs in their eight-year history. While the team won just 30 games and missed the playoffs in his rookie season, the Jazz would go on to reach the postseason in each of Eaton’s next ten seasons- producing the franchise’s first four 50-win seasons in the process. After winning Utah’s starting center sot as a rookie and emerging as a shotblocking specialist (3.4 bpg as a rookie, 4.3 in his second season), the 7’3” Eaton truly established himself in 1984-85, when he produced the best statistical season of his career and one of the best shotblocking seasons in league history. That season, Eaton played in all 82 regular season games, averaging career-highs in scoring (9.7 ppg), rebounding (11.3 rpg) and posted highest blocks-per-game average in league history, swatting 456 shots (the previous record had been 393)- a jawdropping 5.6 per game, more than double Hakeem Olajuwon’s second-place average of 2.68 bpg. While his efforts that season did not earn Eaton a spot on the All-Star team, they were good enough to land him on the NBA All-Defensive First Team and secure the first of his two Defensive Player of the Year trophies. As the decade wore on, the Jazz emerged as a one of the Western Conference’s best young teams, and Eaton's elite defense continued to garner attention. In the four seasons that followed his spectacular 1984-85 campaign, Eaton was selected twice to the NBA All-Defensive First Team (1986, 1989) and twice to the All-Defensive Second Team (1987, 1988). In terms of recognition and accolades, the 1988-89 season was the best of Eaton’s career. That season, while averaging 6.2 ppg, 10.3 rpg and 3.8 bpg, he earned the only All-Star selection of his career, his second All-Defensive First Team selection and was named NBA Defensive Player of the Year for the second time in his career. In his last few seasons with the Jazz, Eaton was slowed by knee and back injuries. He remained an imposing defensive presence, but his rebounding and shot-blocking abilities slowly declined. Mark Eaton spent his entire 11-year career with the Jazz, appearing in the playoffs in each of his last ten pro seasons and playing in the 1992 Western Conference Finals. He is the franchise’s career leader among centers in virtually every meaningful category. Eaton ranks first among big men in franchise history with 875 games played (he missed just 9 of 820 games over his first ten seasons), 5,216 points, 2,072 FG made, 1,857 offensive rebounds, 5,082 defensive rebounds, 6,939 total rebounds and 3,064 blocked shots. Eaton’s blocked shot tally was good for second in NBA history at the time of his retirement, and currently ranks fourth. He remains the NBA's all-time leader with a career average of 3.5 bpg.